It’s hard to believe June is almost over. I almost forg ot about my donation this month. 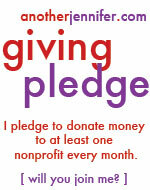 I made a giving pledge to donate every month, and I’m sticking to it. Even if it is summer in Maine, and my mind is on festivals and the beach. June 20 marked the longest day of the year to be homeless. Each year, Preble Street has a group of people that sit outside in the middle of Portland (Maine) from sunrise to sunset to remind people that homelessness is not just a problem in the winter months. There is also a personal connection involved in this donation because a close friend of mine works for the organization. We used to work in a development department in another social services agency in Portland. We were office roomies when I was pregnant with G. I’m also familiar with Preble Street’s work through my association with Crossroads. Making this donation made me realize that I really need to connect with the local shelter and food pantry that are within walking distance from my house in Brunswick. And that’s part of why I’m donating each month. So I can be more aware of the nonprofits around me, and how I can make a better effort to help. I almost missed this post! It somehow ended up in my spam folder….thank goodness I found it since the homeless is such a important subject to me. Really close to my heart! I personally worked with the poor and homeless for 11 years on a volunteer basis with the nuns in my parish before my son and daughter died in the accident back in 2006 and then I took a break, haven’t gone back yet. We had a food pantry-financial assistance available for residence of the city. You are so right Jennifer, donating is so very important for these people. Our program was up and running for over thirty years twice weekly. I did the books as well and I can say truthfully that we helped hundreds of people each month with food and utility needs each month due to the generous donations of our parish members. Although I don’t do it anymore my husband humors me with my little quirks, buying food for homeless persons, bottled water on hot days…things like that since the pressures of going back to the office isn’t something I haven’t yet considered yet. Thanks for sharing, Jen. It sounds like you’re still giving back in your own way. I actually had lunch with my friend who works at Preble Street today. People don’t realize what a problem homelessness is. They think people should just pick themselves back up and get a job. It’s not that easy.